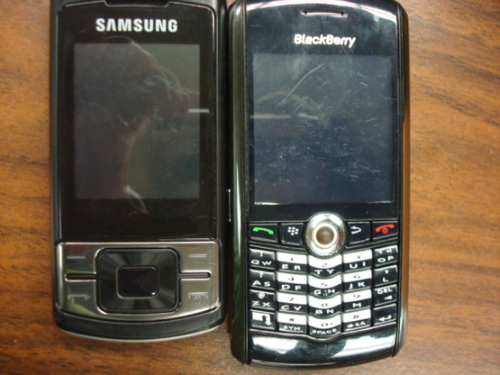 One is a Blackberry and one is a Samsung cell phone. Well, what happened is my Blackberry’s from my home country Saint Kitts. That one has a Saint Kitts number so that’s for my family to call, my friend’s back home to call. And the Samsung phone is my US number that my aunt, my family in the US can call me, and I call my family in Saint Kitts back home. My internet service is from Saint Kitts and its cheaper there so even if I don’t have money, I could ask my family back home, “Could you please top up my phone so that I can use the internet on it?” So it’s easier that way and ’cause the plans in the US are more expensive than the plan I have back home, so I decided to leave the internet on my Blackberry. The next photo is my communication device. 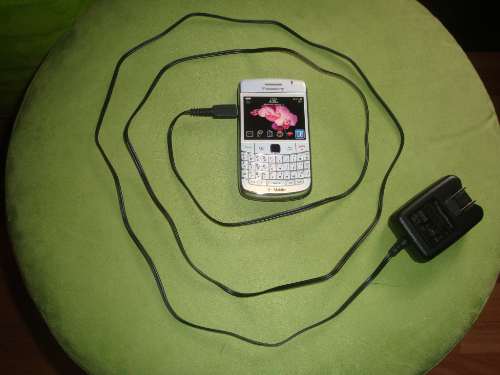 It is my cell phone, my Blackberry, and also its charger which is necessary to use the phone. I use this to communicate, and call people, talk to people. It’s… I don’t have a land line, so this is my most important… It’s my only phone. Yeah. I don’t really chat on the Internet. I mean, I use Facebook, but I don’t really… You know, this is the most, the people who are important in my life have the most direct form of reaching me, which is my phone. Student: Usually I take, like, I’ll always take, like, my netbook with me just to like, to go on the internet. I like the portability of it. And it’s, like, convenient for me. I also bring my Kindle to read some books. Sometime, like, I use that like, as PDF files and work that and screen from there. […] My phone, I use that for, like, everything I need to do. Like emails. Interviewer: Do you do any reading on your phone? 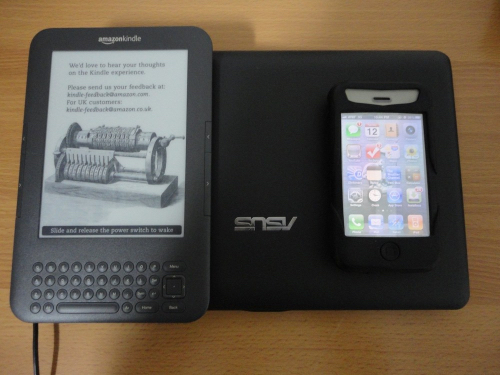 Student: I prefer my Kindle to read, ‘cause it’s more…I like the paper feeling of it by looking at it. ‘Cause I don’ t like looking at LCD screens for that long. Student: So, my phone, my iPod, and my computer. Interviewer: OK. And what do you do on your phone, primarily? Student: Call and text. On my iPod I tend to check email when I’m just like walking around or something. Then my computer for regular email. Interviewer: And do you use any of the calendar functions for the phone or for the iPod? Student: For my iPod, I do. I keep like all my dates and my appointments on here. Because otherwise I’d just be completely lost. Student: I don’t have a cell phone. So, my friends get in contact with me through Gmail. 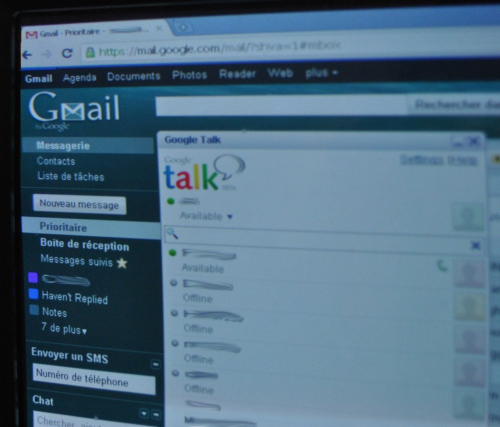 Either GoogleTalk or GChat. Interviewer: Why don’t you have a cell phone? 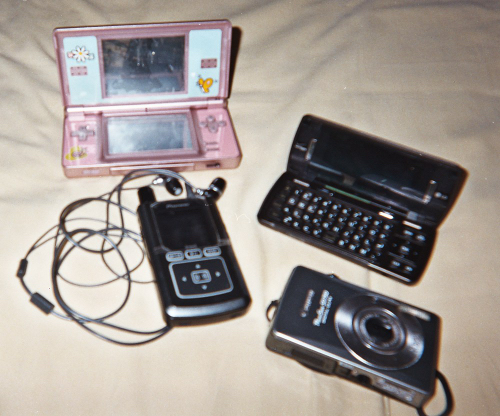 My cell phone, satellite radio, my camera, my Nintendo DS. So I don’t, most of the time I don’t carry these things around other than my phone and my Satellite radio, my camera I carry around when I go out on the weekends or if I am going somewhere special, or if I am taking a photography class. My Nintendo DS, I try to carry around with me when I don’t have a lot of things with me. This isn’t most of the time. I have been actually been wanting to play it recently because it’s just relaxing and it’s fun and you know but now that I am at the end of the semester, I am going to have to wait, I know till at least vacation starts you know? […] They are pretty heavy, so I usually try to carry them around at separate times. But the phone and the Satellite radio usually stay together. The phone I always have with me, my phone I always have with me so, and the Satellite radio is like 95% of the time.